Ask any drug reformed-minded civil society organization at the UN and they will tell you the same thing. The Commission on Narcotic Drugs is draining. SSDP, CSSDP, SSDP Australia, Youth Rise, and YODA members are attending the 62nd Commission on Narcotic Drugs meeting. Here’s an update from Day 3. With the High-Level Ministerial Segment (HLMS) in the rearview mirror, it was business as usual at the United Nations on Monday as the 62nd Commission on Narcotic Drugs (CND) meeting kicked off in Vienna. In 2009, the United Nations adopted what is informally called “The 2009 Political Declaration.” 2019 was the date that the UN agreed they would re-examine the declaration, evaluate its effects, its impacts, and member states success in achieving the goals that they had set out. Help us get to the Commission on Narcotic Drugs! Help two CSSDP board members attend the CND and represent Canadian youth. While the inherently frustrating nature of the United Nations and the Commission on Narcotic Drugs has been particularly prevalent throughout my time in Vienna, the inspirational nature of the civil society groups and young people present this week has shone throughout. The work by NGOs and other individual activists has kept me sane and motivated throughout all of these processes. I had the pleasure of writing this blog post the same day some of the main youth-led NGO groups held their side events. Our own SSDP side-event entitled Youth, Drugs and the 2030 Sustainable Development Goals allowed young people to lead the discussion for once instead of merely having our presence tokenized. The side event discussed why young people need to be meaningfully included in conversations around their health and well-being, specifically in the case of achieving the 2030 SDGs. Panelists Alex Betsos and Nazlee Maghsoudi presented the peer-led cannabis education model being developed by CSSDP, while Penny Hill of SSDP Australia discussed how youth inclusion in drug education makes it more likely several of the SDGs can be met on time. The very personal nature with which Orsi Fehér, chapter leader of SSDP Österreich, spoke was refreshing as she discussed her personal experience using drugs. In a space like the UN, hearing someone “come out” as a drug user can raise quite a few eyebrows. The discussion, co-sponsored by the Government of Canada, enabled civil society groups to speak from a position of genuine experience and discuss the importance of a movement towards a harm reduction model. Stressing the importance of a peer-based education model over the police-delivery model of the DARE program puts value in the voices of young people. The event by YODA and YouthRISE directly after our event, titled Law Enforcement and Youth, brought a diverse panel of people again sharing their own experiences, from getting arrested as a young drug user in different parts of the world, to the other side of the handcuffs and having to deal with the arrest of your own brother as chief of police. A critical analysis of policies from Portugal to Australia showed that the problem of ineffectively dealing with drug use is present across the globe. Regardless of how the policies are labeled, the prohibitionist nature present in even the Portuguese “decriminalization” model invariably leads to unnecessary suffering. A discussion on the frustrating nature of some of the processes at CND by our board member and International Liaison, Alex Betsos. Back in 2017 the Canadian Association of People Who Use Drugs held a protest of Jane Philpott when she spoke at the Harm Reduction International Conference in Montreal. Canadian activists held up signs that said: “They Talk We Die”. The protest was to note that while Canada has made progress and done some good work in responding to the opioid crisis, any attempt by the government to pat themselves on the back was not only premature but disingenuous. While I appreciated the response from other drug policy reformers that the Canadian government was rather progressive in contrast to other countries, the sharp distinction between Canada and some other countries at the UN puts that discussion into better perspective. The Canadian Government has been pushing for a fairly progressive resolution on stigma*. Some civil society members I have met here have called the resolution on stigma, which notes that stigma can be a barrier for people who use drugs to access services, as a bold resolution*. What is unfathomable is that while the Canadian government’s resolution on stigma has been stuck in private sessions (known as “informals”), with a lot of arguments from member states, it took less than an hour to schedule several fentanyl analogues, synthetic cannabinoids, and 4-fluoroamphetamine (4-FA) with nothing more than a few words from the World Health Organization. For a group of member states that have fought tooth and nail over the most minute details throughout the CND, not a single member state made comments about making any of these drugs illegal on an international level. What impact will scheduling fentanyl analogues have on access to fentanyl when fentanyl has been internationally scheduled since the 1990s? From talking to a few people in Canada and also in the Netherlands (both of which have 4-FA scheduled), there is still interest from some people who use drugs in accessing 4-FA. To date, there have been no direct overdoses from 4-FA. Since 4-FA has been scheduled, other New Psychoactive Substances have come onto the market, including 4-fluoromethamphetamine, 2-Fluoramphetamine, and 3-fluoroamphetamine to name a few. The Commission on Narcotic Drugs reflects the reality that all people who use drugs know to be true. For five days, they talk: they talk to people who use drugs, about them, rarely with them, and while they do, our friends and love one’s continue to die. Reprinted with permission from Students for Sensible Drug Policy. The second day of the 62nd Session of the Commission on Narcotic Drugs may have been lighter in content in the form of interesting and progressive side events, but was certainly not without noteworthy occurrences. CSSDP will be attending the UN General Assembly for the first time for a high-level thematic debate towards the UN General Assembly Special Session on the World Drug Problem (UNGASS), scheduled for April 2016. UNGASS is only a year away, and represents a potential turning point for global drug policy reform. The last UNGASS was in 1998, and the upcoming meeting was pushed to occur sooner than later by Latin American presidents pushing for reform in an effort to create dialog on the war on drugs. The idea of achieving a drug-free world is antiquated and even the most conservative member states like Canada admit failure in doing so. As the war on drugs crumbles from the inside, many countries continue to be disproportionally impacted by its violence. The irony of the U.S. taking some of the first steps towards cannabis legalization is incredibly symbolic on a global scale. While most decisions on global drug policy are made at the UNODC Headquarters annually in Vienna at the Commission on Narcotic Drugs, these upcoming meetings are an opportunity to think outside the box of “drugs and crime” and reflect on other outcomes of progressive drug policy such as health and human rights. UNGASS is not just a chance for member states to engage in dialog, it’s also an opportunity for the various bodies and “organs” of the UN to digest this terrible situation we’ve gotten ourselves into. We can all agree that the war on drugs is a failure, and some member states are starting to listen! That’s an incredible opportunity for civil society to engage in dialog, and we’re starting to do just that. CSSDP has met with the Canadian Delegation at CND to voice the concerns of Canadian youth and we’ll be doing that again alongside the Canadian Drug Policy Coalition. Not only are we meeting with our government to discuss our concerns, we’ll be representing youth globally at the Civil Society Hearing! Nazlee Maghsoudi will be representing both Canadian Students for Sensible Drug Policy as well as the International Centre for Science and Drug Policy in her new role as “Knowledge Translation Manager” this afternoon. Tomorrow begins the debate itself, which we will be covering through our blog series. Coincidentally tomorrow is also International Harm Reduction Day, so we hope that it will be a topic of debate! Please check this blog daily to stay up to date on what is happening in New York, and make sure to follow CSSDP on Facebook and Twitter for frequent updates! Despite these drugs not being new per se, their widespread recreational use and creation of new isomers and analogs has exploded globally with over 348 substances identified as of 2013. As such, the Commission on Narcotic Drugs included NPS in Resolution 55/1 in 2012, Resolution 56/4 in 2013, and a new resolution in 2014 building on the prior two resolutions (as well as the 2014 Expert Consultation on New Psychoactive Substances) to address drugs that remain outside the Single Convention on Narcotic Drugs of 1961 and the Convention on Psychotropic Substances of 1971 with the aim of preventing potential threats to public health. Countries have rushed to identify NPS through early warning systems based on the European Monitoring Centre for Drugs and Drug Addiction (EMCDDA), but the amount of new psychoactive substances are increasing faster than governments can restrict them. The data generated by increased monitoring of NPS should be used for public health rather than to further criminalize the people who use them. In North America, NPS are better known on the street by terms such as, “legal highs” or “research chemicals,” essentially substances that have been labeled “not for human consumption” to get around the law. In the media they are known by sensational non-scientific branding such as “bath salts,” “spice” and “plant food.” The first media headlines started coming out in the 2000s, with police units across North America blaming criminals “bath salts” for psychotic behaviour. The case of the Miami zombie attack, an African American man was murdered by the cops while chewing off someone’s face, with the police claiming in their defence that he was crazed on bath salts. Once the coroners report came back negative for bath salts, the media myth had already propagated itself in the mainstream public’s consciousness as many believed that legal highs lead to psychosis. In North America there have been polarized approaches to fighting NPS, from decriminalization of all substances in small amounts in Mexico, to the state by state and federal rush bans of various classes of NPS in the United States. While Mexico’s approach to decriminalizing drugs was not in direct relation to NPS, this could arguably be a trend towards acknowledging that the war on drugs is futile and we need to push resources towards public health services rather than criminalization. This blogpost will examine Canada’s approach to regulating NPS, as well as different policy frameworks available to further reduce the harm for young people who use drugs. Canada has been moving at a sloths pace to regulate these substances, placing Ketamine in Schedule I in 2005 (arguably a NPS according to the UNODC) and in 2012 also rescheduling MDMA as Schedule 1, along with amphetamines and some previously Schedule III cathinones (β-keto amphetamines), such as MDPV but not Mephedrone. Ironically, these cathinone drugs are of the same chemical structure as Bupropion (3-chloro–N–tert-butyl-β-ketoamphetamine), one of the most popular anti-depressants and smoking cessation aid in North America. Bupropion is so widely available that it is sold over the counter at some pharmacies in Canada. For further understanding the Controlled Drugs and Substances Act (CDSA)’s definitions and interpretations of amphetamines and their isomers and analogs, please see this detailed report by Isomer Designs. Due to the vague language of the Controlled Drugs and Substances Act many Canadian based vendors to stay open and until recently there have been very few charges. Most recently one of the longest running legal high companies Izms and PurePillz have had charges laid by the Toronto Police, leading to a widespread fear of future crack downs on other legal high companies, including synthetic cannabinoid manufacturers. That being said, there is no legal precedent for considering synthetic cannabinoids a controlled substance in Canada, so the charges will probably not stick in court. Even if vendors were to go down, with the globalization of drugs happening online any Canadian can find a lab online to produce a new drug that goes beyond the substances scheduled in the CDSA. This ban does not protect young people who use drugs, as the substances are still widely available for cheap online and remain unregulated. NPS are important as their very existence wears away the myth that the war on drugs has a chance of working, as the second that a member state places a ban on a substance several new legal analogs pop up to take its place. In countries which actively drug test their population like the US, synthetic versions of drugs like cannabis increase in proliferation and present new risks. Due to mislabelling of these legal highs and lack of regulation, in some countries there have been several related emergency room visits. Oftentimes these legal highs will find their way into illicit drugs like MDMA, actually increasing the risk of overdose. Obviously this trend in NPS is a concern to not just member states, but also young people who use drugs and harm reduction services globally. We need a rational approach to NPS that is evidence-based, and need to stay away from media hysteria and look at objective policy approaches to reduce drug related harm. In increasing monitoring on NPS we should be using this data for public health rather than working to further criminalize the young people who use them. Lucky for us, there is already more than one member state responding to NPS in a way that is targeted at improving the health of people who use drugs. In order to come up with a new approach to regulating drugs, we will explore two evidence-based policy solutions for reducing the potential harms of New Psychoactive Substances; creating a legalized and regulated market for NPS, as well as increasing access to drug checking for party drug users. As we collect more and more stats on the rise of New Psychoactive Substances, it’s essential that our health services catch up to these emerging trends. Fortunately for us, Vienna has had services geared towards party drug users since the 90’s, through ChEckIt, a public health service created in partnership with is a joint project of Suchthilfe Vienna and the Clinical Institute of Medical and Chemical Laboratory Diagnostics – Vienna General Hospital, funded by the Addiction and Drug Coordination Vienna nonprofit GmbH and the Federal Ministry of Health. Similar to North American public health services for party drug users like TRIP Project and DanceSafe, ChEckIt provides access to harm reduction information and supplies, with an special focus on access to drug checking both onsite and at dance music events to keep young people who use drugs safe. The results of their testing are posted publicly through a colour coded system both at the events at which they’re doing outreach, as well as at their Homebase. Canadian Students for Sensible Drug Policy had the great experience of visiting ChEckIt’s Homebase with Donald MacPherson from the Canadian Drug Policy Coalition, as well as our colleagues from SSDP UK & SSDP Ireland. Not only does ChEckIt do High Performance Liquid Chromatography (HPLC) and LC-MS to do drug checking at parties, they also have a community space where they run harm reduction group programming, as well as access to mental health services like counselling and addictions treatment. Instead of punishing young people for taking NPS, ChEckIt empowers Austrian youth to know what’s in their drugs. One of the biggest dangers of NPS is the increase in mixing, as dealers increasingly turn to research chemicals to avoid law enforcement and save costs as shortages in precursors lead to price hikes. Many drug policy experts do not realize that supply reduction leads to an increase in the production and consumption of NPS, as well as cuts in traditional dance drugs like MDMA and Ketamine. As such, ChEckIt has a warning system designed to alert users on the number of adulterants, testing for hundreds of different substances in under 10 minutes. For more on drug testing, check out the TEDI Project Guidelines for Drug Checking Methodology, developed by the EU funded Nightlife Empowerment & Well-being Implementation Project. It’s clear from the above alternative policy approaches that another way is possible for protecting youth through decriminalizing drugs and putting public health information in the hands of young people who use them. While the Philippines proceed with extrajudicial killings of people who use drugs, youth activists continue to protest against these atrocities. We, the youth organizations, remonstrate by lying on the floor of the Rotunda – the UN exhibition space. Welcome to the 2019 Commission on Narcotic Drugs Ministerial Segment. T oday’s morning plenary session was one that many NGOs had been eagerly (and perhaps anxiously) awaiting. Now that the Special Segment of the UNGASS has ended, the first order of business at the 58th Commission on Narcotic Drugs was voting on the scheduling of several substances, including ketamine. As we outlined in Tuesday’s blog post, the possibility of scheduling ketamine has been an important issue, as it would undermine global health, international law, and the role of science in the international drug control regime. CND member states were set to vote on China’s request to put ketamine in Schedule IV this morning. Instead, at China’s request, the CND voted unanimously to postpone the decision to a future date when “more information could be provided.” Ketamine was not scheduled today, but the issue has not been put to rest. The sentiment of NGOs in response to the CND decision on ketamine was a mix between relief and frustration. At least we were not taking a step back. Ketamine will be easily available for medical use in developing countries for the time being. Yet, we have certainly not taken a step forward and the justification for doing so is inaccurate. The research is already in. Like it didn’t for the last three critical reviews, the recommendation of the WHO to not schedule ketamine will not change. Ketamine should not be scheduled, and putting it off for another year will not alter what should be done on the basis of evidence. NGOs accepted this mediocre outcome today and noted that is was another example of a “step to the side” at the CND. Substances scheduled today at the CND included the following: mephedrone, BZP, synthetic cannabinoids (JWH-018, AM-2201), MDPV, and methylone (bk-MDMA) in Schedule II, and N-bombs (25B-NBOMe, 25C-NBOMe and 25I-NBOMe) in Schedule I. Due to concerns about their prominent use in the manufacturing industry, GBL (gamma-Butyrolactone) and 1,4-butanediol were not scheduled today, despite the WHO recommendation to put them in Schedule I. New psychoactive substances (NPS) is a general term used to describe the explosion of substances available globally over the past 5+ years. In around 2009, the world saw an explosion of NPS, with 102 new drugs identified. It’s important to note that these substances are not necessarily “new.” They’re just new to the global drug control monitoring system. Many of them were developed in the 70’s by Alexander Shulgin, the chemist responsible for MDMA, and many of its various analogs. Alexander Shulgin and his wife Sasha Shulgin are the authors of two psychoactive “bibles” called Tryptamines I have known and Loved (TiKAL) and Phenethylathamines I have known and Loved (PiKAL). These two books are full of chemistry formulas that include recipes to create the majority of popular synthetic drugs. Alexander Shulgin is responsible for discovering, synthesizing, and personally bioassaying over 230 psychoactive compounds in his lifetime. On top of the variety of tryptamines and phenethylamines created by Shulgin, other substances have been labeled NPS by international bodies, including ketamine, synthetic cannabinoids, cathinones, and hundreds of other molecules with not much in common besides being new to the UNODC’s monitoring systems. Many youth harm reduction services saw a spike in NPS in 2010, after the initial rise in innovation. While over the years 2010-2012 there were 85 new substances, another boost was experienced in 2013 when 97 new substances were identified. Between 2013 and 2014 the number of NPS reported increased cumulatively from 348 to over 540. There is no doubt that the rate of new drugs being produced is now happening faster than governments can schedule them. There are real health concerns associated with NPS, including high potency, mislabeling, and adulteration. It is a challenge for health services to keep up with the trends, as drug epidemiology is now globalized with very poor data on what substances are prevalent in which regions. While one NPS might be popular one month, a new one pops up by the time harm reduction resources are created. There is a lack of information and training available for service providers, including EMS, hospitals, physicians, and social workers. There is no doubt that this diversity of substances creates barriers for enforcement, harm reduction, prevention, and treatment, but what is the solution? Like last year, CSSDP returned to ChEckiT to get an update on their programs. We began the presentation by looking at epidemiological data collected through ChEckiT’s drug checking service, including MDMA and speed samples. Currently Europe is experiencing a wave of very potent pure MDMA, but speed is more likely to be adulterated. NPS is still prevalent, with spikes detected in samples in 2010 and now again in 2013, which correlate with the UNODC’s drug monitoring data. By collecting drug monitoring data from the front lines, ChEckiT provides harm reduction information directly to young people who use drugs, and shares the data with public health units. On the tour SSDP, SSDP UK and CSSDP all swapped stories about drug trends in our communities, realizing that similar trends occurred at the same time. Pure MDMA powder became popular in 2006, when the international scheduling of safrole oil (a precursor used in MDMA) meant a massive blow out sale for manufacturers, with MDMA prices dropping and purity increasing. When the markets reached equilibrium and quality resumed to regular levels, the perception of powdered MDMA as a pure substance remained (the cause of the current misperception). We also saw an explosion of NPS in our respective communities in 2010. This was correlated with a rise in the number of online vendors, such as Silk Road. Young people around the world were now able to easily purchase NPS at the click of a mouse. Any effort to cut off the dark net has sprung into a hydra effect, with spin off sites created to fill any unmet market demand. In Canada and globally, a variety of NPS sites exist where you can purchase unscheduled substances ranging from research chemicals to generic pharmaceuticals. There is no doubt that the number of fentanyl overdoses in Canada is related to the availability of cheap generic synthetic super opiates available online. Just a simple google search of “fentanyl buy” generates over 48,000 results. Thus, the ability of the international drug control system to regulate substances is failing miserably. This leads us to question the likely effectiveness of the scheduling efforts this morning to eliminate production, trafficking, and consumption. It’s time to take a public health approach to drug policy reform. ChEckiT is just one component. The first day of the 58th Session of the Commission on Narcotic Drugs (CND) was full of excitement as civil society and member states flew in from around the globe to talk drug policy. As it’s the second time CSSDP has attended CND, it felt kind of like a drug policy reunion! As soon as we stepped foot into the UN, the first thing we saw was a huge beautiful photo installation by the Harm Reduction Coalition. As we headed over to the civil society briefing, we learned that this was the greatest ever civil society presence at the CND! There were so many international NGOs present that we even got seats this year at the back of the plenary room. For NGOs who have been tiptoeing through the hallways for years, this was a huge win! While looking for our seats we ran across another drug policy super star, SSDP’s Executive Director Betty Aldworth. In honour of her first time at CND, I took her on an adventure to the secret glass boxes above the plenary room, where we eagerly folded brochures about our upcoming side event, “Protecting Youth from Drug Policy Reform,” while watching opening statements from member states. While the majority of the opening statements were underwhelming, there were a few that peaked our interest. For example, the EU member states called for a public health approach to drug policy, an end to the death penalty, and an acknowledgement that harm reduction services save lives. Colombia called for new metrics of success for the drug control regime, such as reduction in overdose and other drug related harms. Colombia’s strongest point was that no matter what, human rights should take precedence over fighting the War on Drugs. Considering how many lives have been lost to the War on Drugs in both Colombia and Mexico, it makes sense that Latin America is leading the dialogue for global drug policy reform. Colombia pointed out in their statement that the second you ban something, a chemist has a new drug created to replace whatever has been scheduled. This cat and mouse game has been happening with increasing intensity over the past 5 years, with over 348 new psychoactive substances (NPS) identified as of December 2013 alone. Many member states addressed NPS trends and their increasing availability online, yet there were few to offer up regulatory strategies for addressing this problem beyond prohibition. New Zealand was one of the only countries to do so, as they have legislated a regulatory framework for approving new drugs. Unfortunately, while there were voices calling for change, the International Narcotic Control Board’s statement called for member states to respect the existing drug conventions and asserted that there was no reason to change them. With UNGASS 2016 around the corner, this closed minded rhetoric is disheartening to say the least. Canada also focused on the risks associated with new psychoactive substances, but was vague about addressing exactly how their government policies were reducing these risks. As many young people who use drugs know, mislabeling is common in NPS as they are marked “not for human consumption” to avoid crackdowns. While the root of NPS is evading drug control regimes, Canada cautioned against movements towards decriminalization and legalization. Just like last year, there was no mention of harm reduction, human rights, or abolishing the death penalty. Strangely enough, there was also no mention of civil society engagement. Today’s statement reinforces why Canada is no longer a leader in global drug policy, as the opinion editorial we wrote for the Globe and Mail with Canadian Drug Policy Coalition discussed. Read Canada’s statement for yourself, as reported by CSSDP Chair Nazlee Maghsoudi, to find out more about what Canada said and didn’t say. Notice that Canada also made no comment about ketamine, but we’ll tell you about that tomorrow! CSSDP is returning to Vienna next week to attend the 58th Session of the Commission on Narcotic Drugs (CND), the annual meeting during which representatives from every country gather to discuss the “world drug problem.” Last year, CSSDP attended the meeting for the first time and officially launched our involvement in international drug control regime advocacy. Since last year, CSSDP has become an official member of the New York NGO Committee on Drugs and the Vienna NGO Committee on Drugs, the two bodies which act as a liaison between civil society and the United Nations (UN) on drug-related issues. By being actively engaged in these bodies and attending the CND as one of the few youth organizations present, CSSDP strives to ensure the voice of youth is at the table. Thank you to the Canadian HIV/AIDS Legal Network for making CSSDP’s attendance possible for two years in a row by providing the necessary passes! This year’s CND is especially important because it includes a Special Segment on UNGASS preparations, which is essentially a planning session for the first major UN drug meeting since 1998. The hope is that the upcoming United Nations General Assembly Special Session in April 2016 will be an opportunity for open and honest dialogue about the impacts of prohibitionist drug policies and the options for the future, and what happens at this year’s CND may have a significant impact on that objective. If you would like to learn more about the UNGASS, how civil society can be involved, and why it is so important for youth to be included in the conversation, watch the video below of a plenary panel from the 7th Annual National CSSDP Conference last weekend. Lisa Campbell, Outreach Director at CSSDP, and I, Chair of the Board of Directors for CSSDP, will be attending the CND again this year. CSSDP will be participating in a side event presentation with members of Students for Sensible Drug Policy (SSDP) and Students for Sensible Drug Policy UK (SSDP UK), titled “Protecting Youth from Drug Policy.” For those in attendance, the side event will take place on Wednesday, March 11, 2015 from 1:10 PM to 2:00 PM in Conference Room MOE100. Also with SSDP and SSDP UK, we will be launching our latest project, Drug War Stories, next week in Vienna. Lisa and I will blog everyday on what they are witnessing and learning in Vienna by summarizing, analyzing, and reflecting on all the events we attend. We will pay special attention to any side events related to youth, as well as to the two resolutions involving youth that are being considered at the meeting. The two resolutions are titled “Supporting the availability, accessibility and diversity of evidence based treatment and care for young people affected by drug use disorders” and “Promoting interventions on protection of young people and children with particular reference to the sale of illicit drugs and new psychoactive substances over the Internet.” Both resolutions, as well as all other resolutions to be considered at the 58th Session of the CND, can be viewed here. I will also be blogging for the CND Blog to increase transparency of the international drug control regime. Please check this blog regularly to stay up to date on what is happening in Vienna, and make sure to follow CSSDP on Facebook and Twitter for frequent updates! As some of our Twitter followers may know, the SSDP2014 Conference is taking place this weekend, and CSSDP is present and accounted for! I am thrilled to be representing our amazing organization and to be joining the SSDP network for what is sure to be a weekend filled with interesting discussions, thought provoking ideas, and new connections. For those of you that are not able to be here, follow the CSSDP blog as I report and reflect on what is taking place at the conference. I’ll also be live-tweeting the highlights, so make sure you follow CSSDP. Join me as I celebrate, learn, connect, and advocate! CSSDP has been collaborating with SSDP over the past year to strengthen the international network, which includes chapters in places as far as Ireland and the United Kingdom. This past March when CSSDP went to Vienna to advocate at the annual UN meeting on drugs (which was known formally this year as the “High-Level Segment and 57th Session on the Commission on Narcotic Drugs), we worked together with international SSDP chapters to present at a side event on why criminalization has failed to protect youth, and in fact does more harm than good. Our attendance at this conference is just another way we are working hard to stayed connected to our roots, learn from our partners, and accomplish more together! Has criminalization worked to reduce initiation? Even if it has, was there a less restrictive means at doing the same thing? Has it protected children whose parents use drugs? Has it helped to protect children from drug use in the community? Has it helped to protect children involved in the supply chain (from production to sales)? From a child rights perspective, those questions have to be answered. “We have to protect children” is used on both sides of debate. We must run the policy through a child rights analysis. Students for Sensible Drug Policy Ireland was next to weigh in on the panel, sharing a quantitative survey with eleven questions to understand drug use amongst youth. Their survey found that 92% of students have used legal or illegal drugs in the past and 65% have done so in the past week. 91% of participants know the legal status of the drugs they are using and 25% of participants have listed themselves as using illegal drugs. 10% came into contact with the law as a result of drug use, yet 78% of students that came into contact with the law did not change their drug use. Of the students surveyed, 44% of students think some drugs should be regulated like alcohol. We are personally affected by the loss of lives amongst youth drug users. In 2007, the federal Conservative government initiated the National Anti-Drug Strategy (NADS). Priority areas of NADS include prevention, treatment, and enforcement. Note that this does not include harm reduction. In 2008, the leadership of NADS was removed from Health Canada and relocated to the Justice Department. Federal government has fought against InSite, a safer injection site in Vancouver. In 2011, a landmark decision was made by the Supreme Court of Canada to keep InSite open despite the Harper Government’s objections. The recent Respect For Communities Act is another effort to shut down InSite, as the Harper Government is making it more difficult for the clinics to open elsewhere in the country. Canada’s statement during the High-Level Segment did not include any mention of human rights, harm reduction, the use of the death penalty in drug strategies, or reducing the spread of blood-borne infections. Medical marihuana laws have regressed, as the Harper Government has privatized the program, taking away patients right to grow and raising the price. There are discrepancies regarding Canadian drug policy funding, both in regards to the total amount and the distribution of funding between prevention, treatment, harm reduction, and enforcement. An independent audit conducted by researchers for the International Journal of Drug Policy and a National Anti-Drug Strategy (NADS) Evaluation – Final Report present different amounts and percentages. This is troubling for youth, as we would like greater transparency and accountability. In an attempt to better understand the portion of the NADS budget that was allocated to activities targeted towards youth, as well as the division of such activities between prevention, treatment, harm reduction, and enforcement, an analysis of information provided in the National Anti-Drug Strategy (NADS) Evaluation – Final Report was conducted. It was found that 98.2% of spending targeted at youth in the NADS seemingly goes towards prevention activities, and the remaining 1.8% goes towards treatment activities. This distribution of funds is troubling. On the ground, we feel the real effects of inadequate treatment funding targeted for youth. Use of prevention funding is also troubling, as prevention activities are not presented through a neutral lens (examples include two websites, namely www.xperiment.ca and www.not4me.ca). CSSDP has launched campaigns in the past to combat this (www.not4me.org) by providing evidence-based information to allow youth to make informed decisions about drug use. After our panel, I had the amazing opportunity to attend the press briefing with Russell Brand, and actually ask a question! Before the briefing, he had the chance to speak with many delegates including member states and NGOs. 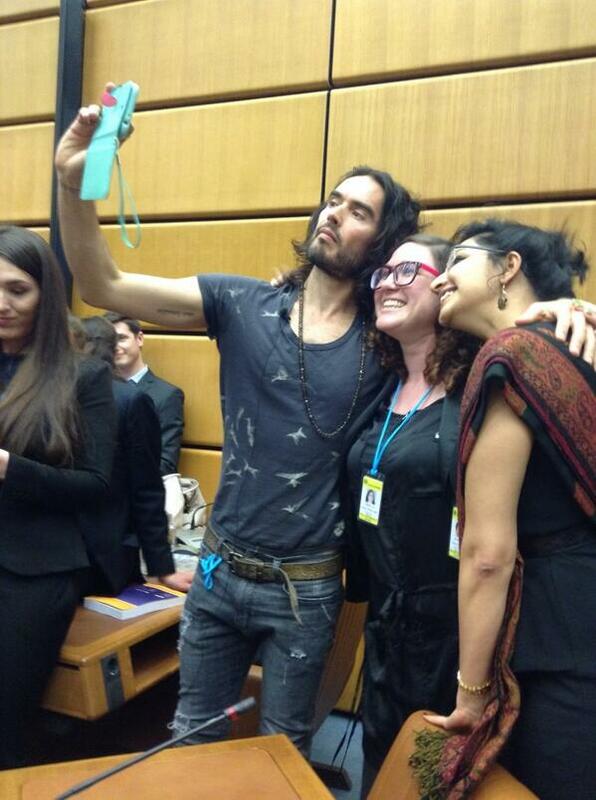 Russell Brand mania swept the UN, as he continued to bash the war on drugs and advocate for the human rights of drug users. While Russell Brand is in recovery and believes in abstinence-based education, he acknowledges that it is not a reality for everyone and that some people can use substances recreationally and still live functional lives without harming society. According to Brand, no one is helped by drugs being illegal, unless there is a conspiracy to continue to marginalize communities who are already oppressed. If the point is not oppression than there is no reason to continue this cycle of criminalization and death. Shortly after Russell’s spiel, an NGO representative from Moldova gave a statement on the situation in Crimea and how it will negatively affect people who use drugs. There are over 800 methadone users in Crimea who will have their prescriptions canceled, and it’s important that there is a UN stance on this issue. While Russell Brand is not a big fan of methadone, he did acknowledge that people can benefit from methadone as part of a journey to recovery. Global drug laws need to change because thousands of people are dying. According to Brand, if people want to take drugs, that’s their business, and recovery is a solution for those who have problems. We shouldn’t “quibble”, but stand together to end the war on drugs. It is important that people who use drugs have options and the right to choose the lifestyle that suits them, whether it is continuing to use drugs, practicing harm reduction and/or being in recovery. The consequences of the drug war are deadly, including mass murder in Mexico and people being hung in Pakistan and Malaysia for drug-related offences. Towards the end of the briefing, two members of the Canadian NGO delegation had the opportunity to ask questions. Canadian Drug Policy Coalition Director Donald MacPherson asked about Brand’s support for InSite, and CSSDP Outreach Director Lisa Campbell asked about ending the war on drugs. Russell Brand says he has nothing but respect for Liz Evans and her harm reduction program at InSite, which is a low-entry point model and was devastated to hear that the management was forced to step down. Nazlee continued guest blogging for the CND Blog hosted by the International Drug Policy Consortium (IDPC) today. She covered the side event we participated in and the Plenary’s tenth meeting, during which UNODC chairs discussed Item 9 a) b) and c), and opened the floor to discussion from member states. The following member states made statements during the Plenary: EU, Portugal, Thailand, China, Kazakhstan, Korea, Indonesia, Japan, India, U.S., Norway, and Canada. On the NGO side, Red Cross and the International Harm Reduction Association made statements. All of her posts are now available on the CND blog and have been linked for the convenience of our readers here. As is the tone of the CND Blog, Nazlee’s posts reported on exactly what was said in these sessions without adding personal reflection. AN EVER CHANGING PROBLEM NEEDS EVER CHANGING RESPONSES. DOING NOTHING IS NOT A SOLUTION. Remember to keep checking our website for daily blog updates. We are also live tweeting all events we attend, so feel free to follow the conversation online on Twitter. In the Americas, the War on Drugs has had disastrous consequences, leaving countries like Mexico with over 60,000 dead, filling prisons with the marginalized and shattering the social fabric of communities. Prohibition has arguably had a greater cost to society than the drugs themselves, and continues to fuel organized crime and violence. Originally called for by Nixon in 1971, the war on drugs has been a catastrophic failure. If any region has paid the price in terms of social, economic and public health outcomes, it has been Latin America, which is why it is no surprise that such member states are vehemently opposed to the continuation of prohibition. As well, the war on drugs has been used as a tool for neocolonialism and to justify overthrowing governments in Latin America throughout the 1980s by Reagan. Several Latin American member states have called for an urgent reevaluation of prohibition leading up to the UNGASS 2016 while at the High Level Segment of the Commission on Narcotic Drugs. Building on this movement of drug policy reform, the General Secretariat of the Organization of American States has produced a special report on the Drug Problem in the Americas, including Scenarios and Case Studies which can serve as tools for debate. At the Commission on Narcotic Drugs these tools were presented to the world at a side event titled, “A Tool for Debate: The OAS Report on Drug Policy” organized by the Governments of Guatemala, Uruguay, Mexico, Colombia, the Organisation of American States (OAS) and the International Drug Policy Consortium (IDPC). The full report is available for download on the IDPC website in English, French, Spanish and Portuguese. You can find a summary of the event on the IDPC blog. The report presents four possible future scenarios, acknowledging the potential outcomes from different approaches that OAS members can adopt to reduce the harms for drugs in their countries. As many member states increasingly call for a flexible interpretation of the drug conventions, we can see that some OAS member states such as Uruguay are already experimenting with what the path forward could be. Milton Romani, Uruguayan Ambassador pointed out that there is no one size fits all solution for the world, and that we need to respect countries’ culture, traditions and institutions within the framework of international cooperation. However, HE Luis Alfonso de Alba, Ambassador of Mexico stressed that flexibility in the conventions should not be used for unilateral actions without discussing and evaluating the options with other affected member states. HE Miguel Samper, Colombian Vice-Ministry of Criminal Policy and Restorative Justice praised the report for institutionalizing discussions which were before “underground” and for opening up a dialog for elected officials to engage in the debate, not just ex-presidents. The debate will not stop here, as over the next month Columbia is hosting 10 forums during which the report will be discussed. Romani closed by pushing for frank debate and an acknowledgement of the spirit of this comprehensive report at 2016 UNGASS. We cannot accept the increasing levels of violence in states in the name of a war that does not respect human rights; we must develop alternatives. But how do member states gather los cojones to challenge the drug conventions? What are the recipes for success to developing alternative policy frameworks? Open Society Foundations presented a panel in the afternoon featuring representatives from Czech Republic, Switzerland, Portugal and the Netherlands to share their experiences on developing alternative drug policy approaches centred on public health in their event, “Banking on Evidence: Drug Policy Experiences in Europe”. Hosted by Joanne Csete, deputy director of the Open Society Global Drug Policy Program, this panel explored what elements were needed to lead to the creation of sustainable alternatives ranging from decriminalization to cannabis cafes to harm reduction services (such as needle exchanges and drug checking). The panelists echoed that the key ingredients to sensible drug policy included having a a multistakeholder approach including civil society, experts, scientists, politicians and the general public. For the Netherlands, Czech Republic, Portugal and Switzerland, drug use was controlled under the Ministry of Health, and as such a public health approach was developed. Switzerland pointed out that another advantage of tackling drug use from a public health perspective is that you can also include legal substances, such as alcohol and tobacco. For each country, the motivation for reforming drug policies and public health interventions was different, ranging from reducing the spread of blood borne infections to preventing overdose to keeping the streets free of crime. No matter what the motivation to change, the benefits of these reforms are clear through rigorous data collection and evaluation. One clear message from nation states who are undertaking “flexible” interpretations of the conventions is that policymaking is a continuous process of tinkering and evaluation. There needs to be a climate in society that is tolerant to change. Moreover, monitoring and evaluations must be used to ensure that these interventions are sustainable and resistant to political change. For the Dutch, the coffee shop model for cannabis was meant to be a temporary solution while the rest of the world caught up to the times, but it has ended up enduring to this day. On top of good infrastructure, the Dutch also pointed to the need for fostering debate on a municipal level so that policy was not a top down process. Town hall meetings were an important element for dialog between sectors and led to long lasting policies. The Swiss emphasized that it was important for policies to come from the grassroots from key affected populations, including people who use drugs. When the debate is hot it’s difficult to think of science. It is clear that the drug conventions have been, and continue to be flexibly interpreted by member states. While it is difficult for countries to challenge prohibition, there is a new consensus emerging in Latin America that this must be done. The aforementioned European states serve as an example that another world is possible, and that member states feel confident in challenging international drug policy when negative outcomes arise. Whatever emerges from the debate, it is clear that drug policies must be adapted to respect human rights, public health and the unique cultural contexts of member states. Too many people have died over this war, and it is time to take money out of the hands of organized crime and focus on the overall health of society, including people who use drugs. While the debate is hot, we have lots of evidence on hand to support a public health approach to drug policy, including the latest scientific statement presented at the High Level Segment last week. PUT ASIDE IDEOLOGIES AND POLITICS, ALLOW SCIENCE TO SPEAK, BECAUSE IT IS ONLY US IN THIS ROOM THAT CAN CHANGE THE POSITION OF INTERNATIONAL DRUG POLICIES. Remember to keep checking our website for daily blog updates. We are also live tweeting all events we attend, so feel free to follow the conversation online on Twitter. You can also tune into the live webcast. We continued to hear member states’ preliminary statements in the General Debate today at the 57th Commission on Narcotic Drugs (CND) High-Level Review. The Round-Table Discussion regarding Money-Laundering also took place. For a detailed account of the statements made at both of these events, please consult the International Drug Policy Consortium’s CND Blog at http://www.cndblog.org. In addition to the official events, Uruguay held a press conference today to discuss their creation of the first regulated market for cannabis (exhibited in the photo above taken from @encod). The following is a reflection on selected key comments made during the events today. Uruguay’s press conference provided a thought-provoking and convincing rationale for their creation of the first regulated market for cannabis. They approached their defense by providing a critique of politics, during which they stated, “Politics means convince people. When policies don’t show favourable results, our first instinct is to insist on our policies. We need to change.” Uruguay recognizes that it is the government’s responsibility to not fall into this trap of politics. This very thought process led Uruguay to change their drug policies by creating a regulated market for cannabis. In the words of Uruguay, “We know that prohibition is not the answer because the evidence is overwhelming. The evidence is clear, so why don’t we change?” However, they are also not unconditionally committed to their new approach, as they stated, “If this does not prove to be the right decision, we will change again.” Evidently, Uruguay is committed to evidence-based drug policies and refuses to play political games, particularly when the cost of ineffective drug strategies is so high. Uruguay stated that their decision to create a regulated cannabis market was based on three fundamental objectives, namely to go one step further than decriminalization, to assure cannabis users legal access to cannabis, and to combat the black market of cannabis. Cannabis is not intended to be a regular commodity, and Uruguay is working to increase the awareness of risks associated with cannabis by members of their population. Canada’s preliminary statement in the General Debate did not include any mention of human rights, harm reduction, or the use of the death penalty in drug strategies. In these ways, Canada has lagged behind other member states, who have been much more progressive in their statements (and in their actions). Canada did, however, discuss the importance of identifying and disseminating information on New Psychoactive Substances (NPS), as well as working with civil society and all stakeholders in devising strategies going forward. CSSDP, along with the Canadian HIV/AIDS Legal Network and the Canadian Drug Policy Coalition, will be meeting with the Canadian representatives next week. UTOPIA CANNOT BE REACHED – THAT IS, THE ELIMINATION OF ANY DRUG CONSUMPTION. THE FINAL AIM IS ACHIEVING THE WELL-BEING OF INDIVIDUALS. 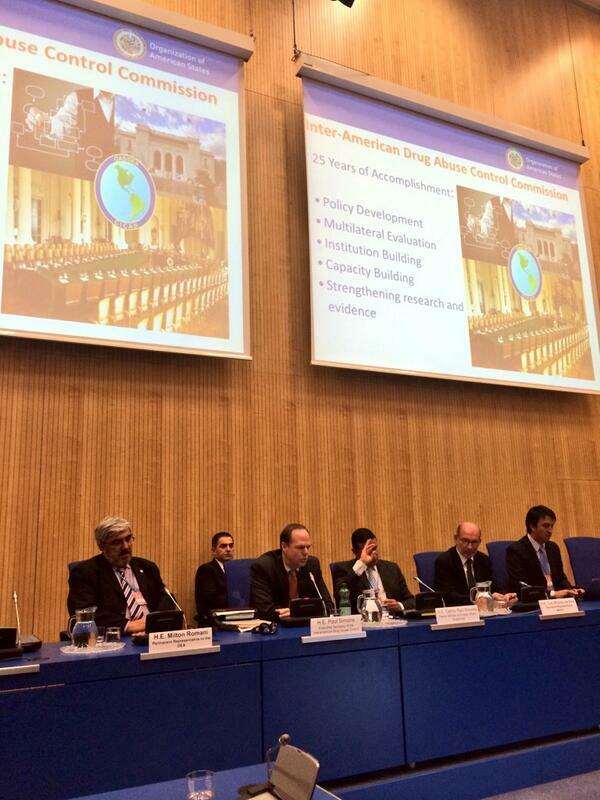 The following events took place today at the 57th Commission on Narcotic Drugs (CND) High-Level Review: the Round-Table Discussions regarding Demand Reduction, the High-Level Briefing of the 3rd Informal Civil Society Hearing and the 2014 UNODC Scientific Consultation, and the Round-Table Discussions regarding Supply Reduction. During the Round-Table Discussions, the General Debate was also taking place, during which member states made their preliminary statements. For a detailed account of the statements made at each of these events, please consult the International Drug Policy Consortium’s CND Blog at http://www.cndblog.org. The following is a reflection on selected key comments made during the 3rd Informal Civil Society Hearing and the 2014 UNODC Scientific Consultation, and the General Debate. Many first statements, including scientists, doctors, youth, and states, included the importance of harm reduction and the need to move drug policy outside of the criminal realm. The 2014 UNODC Scientific Consultation highlighted that substance abuse disorder should be treated as a medical and public health issue, rather than a criminal justice or moral issue. States must stop incarceration for minor, non-violent, drug-related offences. In the words of Nora Volkow (Director General, National Institute on Drug Abuse, United States of America) “imprisonment does not equate with treatment.” Michel Kazatchkine (Special Envoy for HIV/AIDS in Eastern Europe and Central Asia, United Nations) added that there is a “significant gap between what science has shown works, and what is in reality being implemented by countries in their policies.” He stressed that harm reduction interventions (particularly needle and syringe programs), in combination with opiate substitution therapy, are compelling strategies that indisputably reduce HIV and hepatitis transmission, mortality, drug dependency, crime, and therefore result in improved quality of life. Policies that hinder access to harm reduction must be reformed, as they result in stigma and policy displacement, which in turn undermine support for harm reduction. Harm reduction interventions are cost-effective and consistent with the UN Drug Conventions, but are not used widely enough. The European Union (EU) agreed with the key points of the UNODC Scientific Consultation, as the EU’s experience and a multitude of robust evidence have indicated that harm reduction is effective and must therefore be used. The EU is a strong supporter of comprehensive drug strategies, and especially of risk and harm reduction. Norway stated, “we know what works, we have to implement what works, and then evaluate our progress,” again emphasizing the gap between the lessons learned from evidence-based practice and drug policies worldwide. Mexico’s statement emphasized that drug and supply demand reductions are not enough to solve the global world drug problem and these strategies should not cause outcomes that are more harmful to the social fabric than the problem they are intending to solve. Mexico will take this opportunity to enrich the existing pillars of supply and demand reduction with efforts that aim to prevent and reduce unintended effects. The new dynamics and approaches that have emerged in recent years should be analyzed and not denied, as these unilateral violations indicate that there is no longer consensus about international drug strategies. Only coordinated actions will enable us to respond to global challenges. Mexico therefore believes that states need to collectively generate strategies using a long-term perspective with the health and safety of society at the core in order to combat the world drug problem that transcends international borders. This change does not reject law enforcement, but recognizes the vulnerabilities that can lead to more harm than good. Nevertheless, there were some clear divergences in perspectives. Queen Silvia of Sweden advocated for zero tolerance of drugs and stated that the UN Drug Conventions are the best path to accomplish this as an international community. CSSDP, as well as numerous other NGOs, disagree with what is implied by the question posed by Raymond Yans. Recognizing that times have changed means acknowledging that we are now more well-informed about the successes and the failures of our past drug policy approaches. While in the past drug policy was driven by ideology, with time we have learned that a new strategy may be needed. As observers at today’s events, we felt at many times that contrasting opinions were masked by the use of similar language. Those that seemed to be advocating for reform, and those that were more content to stay with the status quo, used words such as “public health,” “evidence-based,” “balanced approach,” and “reducing harms.” It seemed that the intended meanings of words differed depending on the individual using them, thereby creating an illusion of consensus. There were, however, some beautiful words heard at today’s events. This year’s Students for Sensible Drug Policy (SSDP) annual conference in Washington, D.C. occurred the weekend before the United Nations General Assembly Special Session on Drugs, so some sessions were in preparation for this high-level international drug policy event. One such session was “Road to UNGASS: What you need to know about the special session and why it matters”. The panelists, among them Scott Bernstein, a lawyer that works for Open Society Foundations, and David Borden, founder of StopTheDrugWar.org, provided an excellent overview to prepare us for the week ahead. Bernstein opened his presentation reminding us all that psychotropic substances have been a part of human culture for millennia, while our attempts to control drugs is a more recent development. International drug control began with the 1912 International Opium Convention. A number of treaties were signed over the following five decades to control coca leaves, cocaine, and cannabis These treaties were then consolidated into the 1961 Single Convention on Narcotic Drugs, which strictly prohibits the use of narcotics outside of scientific and medical uses. In 1971, the UN introduced the Convention on Psychotropic Substances in order to control amphetamine-type stimulants as well as psychedelics. The Convention Against Illicit Traffic in Narcotic Drugs and Psychotropic Substances was later signed in 1988 and provided additional legal grounds to target increasing rates of international drug trafficking. Member states of the United Nations are expected to enforce these three major international drug control conventions, while the International Narcotics Control Board (INCB) operates as the watchdog for treaty enforcement. When a member state operates outside of the Conventions (i.e. by regulating cannabis or establishing safe injection sites ), the INCB “names and shames” the country at the international level. The effects of these conventions and the bodies established to oversee their enforcement are felt worldwide. However, the degree to which the treaties are enforced varies from country to country. The UN General Assembly meets every year and 29 special sessions have occurred in the 61 years since the UN was established. However, only two of these meetings dealt with drugs: first in 1990 and then again in 1998. In 1998, the meeting’s slogan was “A Drug Free World, We Can Do It!”. In retrospect, Bernstein suggested that a more accurate slogan might be “A Drug Free World: We Didn’t Even Come Close” due to the absolute failure of international drug control; drug use and availability has increased worldwide despite the prohibitionist attitude adopted by the UN. The slogan for this year’s UNGASS is “A Better Tomorrow for the World’s Youth”, however to our knowledge Canada is the only country to include a youth representative on their delegation — CSSDP’s Co-Chair Gonzo Nieto. The outcome document adopted at UNGASS was prepared in Vienna earlier this year at the 59th session of the Commission on Narcotic Drugs. Unfortunately, the outcome document does not mention of harm reduction, nor does it contain a moratorium on the death penalty for non-violent drug offenses. Despite the UN’s refusal to lead on these issues, some countries are choosing to go forward and operate outside the Conventions. Notably, Canada has announced cannabis legalization in the coming years and continues to expand its supervised injection sites, and some EU countries have implemented heroin maintenance programs. While we may look to the UN General Assembly for leadership on drug policy issues, the reality is that progressive change will be adopted at the international level once it exists in more and more member states. For this reason, the coming three years will be an important time for civil society groups and others seeking change to work hard to see this change realized on a national level in their respective countries. As Canada is committed to legalizing cannabis, establishing safe injection sites across the country, and espousing harm reduction principles, we are optimistic that ours can be one of the countries that will shape what drug policy will look like in a post-prohibition world. Michelle will be graduating this summer with a BA Honours psychology degree from the University of British Columbia. Her thesis focused on the association between classic psychedelic use and violence towards oneself and others. She will begin her Master’s in Clinical Psychology in the fall of 2016 where she plans to continue to examine the motivations and outcomes of the recreational and therapeutic use of cannabis and psychedelics. She co-founded the UBC Okanagan CSSDP chapter in 2015 and is currently the chapter Chair. Michelle’s interest in drug policy reform grew from her concern over medical cannabis patient barriers to access and has spread to other therapeutic substances. The irony of having a “high” level debate on drug policy escaped no one, except maybe the member states present at the United Nations General Assembly last Thursday May 7th. The High Level Thematic Debate (HLTD) on the 2016 Special Session on the World Drug Problem was the first of many conversations at the United Nations General Assembly leading up to UNGASS 2016. Yet with long speeches read from carefully crafted written notes, there very little room for debate. Civil society voices were notably absent from the morning dialog, until the afternoon when just two were allowed to address the global assembly. How do we get to a higher level, if the majority of member states seem still stuck on the process of how we should be creating a dialog on drug policy instead of talking about drugs themselves? Some were absent from the debate entirely. While High Level Thematic Debates are common within the UN, there was a high sense of urgency in the air as the debate took off Thursday morning. During the morning session Yesid Reyes Alvarado, Minister of Justice and Law, Colombia urged the UN General Assembly to decriminalize drug use and not just focus on demand reduction. Mark J. Golding, Minister of Justice of Jamaica also gave powerful statements urging the UN General Assembly to reconsider cannabis within the international treaties and allow member states greater autonomy in scheduling. The European Union, Argentina and New Zealand all included harm reduction in their statements, which was refreshing given the majority of countries do not acknowledge it as an essential public health intervention. Russia also made some hilarious statements about starting a drug policy scientific institute, when there are peer reviewed journals citing the destructive effects of the domestic drug policy which bans Opiate Substitution Therapy (OST), and how it has cost countless lives nationally and now in newly annexed Crimea. Most exciting part of the morning was the panel, “Achievements and challenges by Member States in countering the world drug problem” which included Ruth Dreifuss, Member of the Global Commission on Drug Policy and Former Swiss President and Milton Romani, National Drug Board Secretary, Uruguay among others pushing for change. As well, civil society representative Sandy Mteirek, Advocacy Coordinator at Skoun, Lebanese Addictions Center (pictured above) also gave powerful remarks in the afternoon on the impact of drug policy on people who use drugs in Lebanon. The full statements are available on the CND Blog for further reading. What was clear from the HLTD was a strong desire that discussing drugs would not just be business as usual, but that a frank honest debate was needed. What transpired was the exact opposite, mostly including recycled statements from the Commission on Narcotic Drugs last March. While we may think of the UN as a well-oiled machine, there are several barriers to having an open honest debate on drugs. One barrier that came up frequently was the lack of funding for civil society engagement, despite all efforts to include them. Even member states were short on resources to prepare, as drugs are not apart of the normal duties of Permanent Missions based in New York. It is frustrating to see the UN in action, as young people expect that policies at the UN level should be less dictated by politics (i.e. we don’t vote for our diplomats), but more on evidence-based policy. Despite the rhetoric of “evidence-based” drug policy, there was little mention of harm reduction despite being International Harm Reduction Day last Thursday. UN member states are tied to their governments in power, so as much as they try to stick to the evidence, they’re limited as to what they can say on behalf of whatever government is in power at the time. Canada is a perfect example of that, as the rhetoric of the Harper Government once again prevailed in their statements albeit diplomatically. While the speech was not too different than CND, there were a few points worth noting. Once again Canada acknowledged the prevalence of New Psychoactive Substances, and the importance of drug monitoring systems to track and produce alerts to the public. While Canada was focused on protecting youth, their strategy of investing millions in Public Service Announcements (which aren’t evidence based) is ironic, especially with such little funding available for youth treatment or harm reduction services. Finally, Canada stressed that legalization and decriminalization efforts underestimated organized crime, once again a statement lacking supportive evidence. It’s clear that while some progress is being made on the global level, we have a lot of work to do before we get to a frank honest debate based on evidence. One can hope for several scientific panels from the various UN bodies at UNGASS 2016 next spring, including the World Health Organization and UNAIDS whose voices have often been side lined at the Commission on Narcotic Drugs in Vienna. Despite the tension present, it’s clear that the UN General Assembly in New York is a much more neutral space for debating drug policy then the United Nations Office on Drugs and Crime in Vienna. While it will take a lot of diplomacy to get the UN to reconsider how drugs are controlled on an international level, this is certainly a start in the right direction. It’s no secret that Canada has lost its international leadership role in drug policy. The passing of Bill C-2 in the House of Commons this week reminds us how far off course the government has come from evidence-based and public health driven policies for illegal drugs. Canada’s statement at this month’s 58th Session of the Commission on Narcotic Drugs is another look into the bleak future of drug policy in our country under the current government. If this is Canada’s stance at the UNGASS, the biggest meeting the UN has had about drugs since 1998, we can forget about regaining our reputation as a global leader in drug policy. Canadians have an obligation to demand that our government take a serious look at the evidence, rather than make statements based on little more than political rhetoric. Removing criminal penalties for the personal use of any drug should no longer be a controversial topic. Evidence has increasingly told us that decriminalization leads to reductions in the harms caused by drugs. The benefits experienced in Portugal, such as the significant reduction in the number of people with drug-related diseases, is perhaps the most cited example. In reality, decriminalization is a policy that has been increasingly adopted by countries that prioritize public health. The World Health Organization has even recommended decriminalization, indicating that decriminalization is a best practice in drug policy. It isn’t just the caution against decriminalization and legalization in Canada’s statement that is troubling. Although the statement is not explicit, the Canadian government seems to be implying that the power of organized crime would not be weakened by a reform in drug policies. Yet, legalization would eliminate a major revenue source for organized criminals. Even if their revenue sources are highly diversified and the impact on organized crime is minimal, taking control from the illegal market and putting it in the hands of government can improve the outcome that we must be most concerned with: the health and safety of our communities. Stephen Harper has said, “I think what everyone believes and agrees with, and to be frank myself, is that the current approach is not working, but it is not clear what we should do.” We at CSSDP don’t think it could be any clearer. Canada needs to put people’s health first. And any policy that does so must include decriminalization and legalization. As the UNGASS approaches, we cannot stop reminding our government that if anything is concerning, it’s Canada’s current approach to drug policy.